InvestorCentric: How Will Deflation Worries Affect Gold? How Will Deflation Worries Affect Gold? Gold has historically been an asset that people turned to when they are worried about inflation. Today, though, we are in a very unique situation. Governments around the world still don't have inflation under control, but there is a lot of worry right now of deflation. Because inflation is tracking down and deflation is on the horizon nuemours measures are being taken that could have dramatic impact on inflation, and the price of gold, in the future. Deflation may or may not ultimately come, but if it does what impact will it have on Gold prices? What about if deflation doesn't come, and inflation spikes, what then? Tim Iacono from The Mess That Greenspan Made looks closer at that question in his blog post below. This morning's Ahead of the Tape column($) in the Wall Street Journal neatly summarizes conventional wisdom regarding gold, beginning with the 'ol "inflation hedge" saw. As the quintessential hard asset, one that traditionally hedges against rising consumer prices, gold's trajectory these days should be downward. After all, prices for just about every other commodity, from oil to nickel to cotton, have plunged as inflation risks have seemingly abated and as investors increasingly fear deflation. Yet, gold has largely traded between $750 and $850 an ounce for the last few months, and is up about 8% since the Fed cut interest rates to between 0% and 0.25% last week. It hasn't been an entirely smooth ride. Gold sank amid panic this fall as investors crowded into the U.S. dollar. And it remains well under its $1,002 close back in March. But the metal hasn't stumbled nearly to the degree many other commodities have. 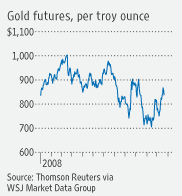 Clearly, deflation worries aren't tugging at gold. It's probably fair to say that, with what the central banks around the world have been doing over the last year or so, gold owners who are now worried about the recent downward trend in the consumer price index are few and far between. And while inflation isn't apparent today, stimulus packages and bailouts mean much more money in the system. That is classically inflationary. Moreover, despite efforts to sop up this liquidity later, the effects of unintended consequences might mean some portion of the trillions added to the Fed's balance sheet are likely to "stick around" to fuel inflation, says Axel Merk, who recently increased gold exposure in his Merk Hard Asset Fund and personal portfolio. Says Malcolm Southwood, commodities analyst at Goldman Sachs JBWere in Australia, "I'm telling clients that the environment over the next five years is extremely constructive because of the inflationary risks further out." Near-term gold could still demonstrate some weakness as the last of the panic trade peters out. And if the European Union cuts interest rates, as some expect, that could boost the dollar's value, which could undermine gold. And U.S. and European Central banks could sell gold to raise cash to pay for bailouts, which would be bearish for gold prices. But Mr. Southwood suspects Asian central bankers looking to diversify reserves would grab that supply, seeing the sales as "an alarm signal about the dollar." And what if deflation does hit? Even that doesn't necessarily spell doom for gold, as some think. During the deflationary Great Depression, "gold preserved its value," says Matt McLennan, a lead manager at First Eagle funds, which runs a gold fund. "It preserved its purchasing power." Yes, some of this new money is likely to "stick around" as Axel Merk says - maybe a lot of it. Good post! I think the consequences to recent monetary policy action will be steep inflation. No idea what the price of gold will climb up to but in any case I'm glad I own some.